Since we are right smack in the middle of summer, surely the rising temperatures will send you to cool off somewhere at a retreat, or perhaps for you to take up the sport of swimming, and even chilling out at a nearby waterfall. 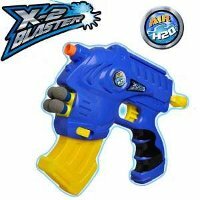 For those who have kids who do not want to go out and smell the flowers, but prefer to remain cooped up at home, enjoying the latest video game, here is the £9.99 X2 Water Blaster to help entice them to do so. This device is actually a 2-in-1 blaster – not only does it send streams of water at your target, it will also be able to shoot foam darts. The working range for foam darts stand at 35 feet to soften up your opponent from afar, while it also has a 30 foot range for its jet of water. Splat or splash – it really depends on how merciful you are feeling that particular day, just make sure you have good aim. Too bad there are only four foam darts to play with, and you have got to collect them once they’ve been fired. Best to just stick to the water option which comes in a removable water clip.